This recipe is a little exotic. But, not too much…it couldn’t be too crazy for my crowd. 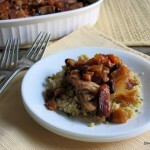 I recently made chicken tagine in a slow cooker. It was a BIG hit! Boneless, skinless chicken thighs were a nice variation from the white meat we usually enjoy. The tagine, true to its origins, was a medley of fragrant spices including cinnamon, ginger and cumin that was fruity from the apricots and raisins. 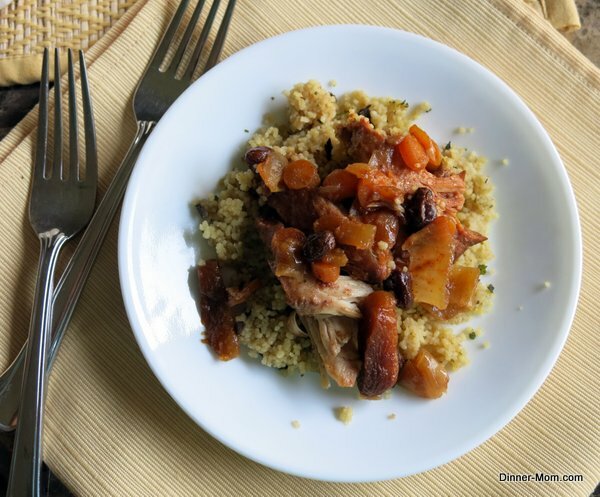 I served the chicken and broth full of fruit and vegetables over couscous to rave reviews…it had been awhile since I served this one. What is tagine, you might ask? I just love when dinner involves a bit of history! A tagine is a ceramic or clay cooking vessel with a dome top that is used to cook stews of meat, vegetables and fruit. It is designed to sit over coals and allows for the use of very little liquid during the cooking process (a necessity in some parts of the world.) In case you are curious, here is a Tagine by Le Creuset that is for sale on Amazon. More frequently, tagine is used to describe the North African or Moroccan cuisine that cooks in such a vessel…such as this recipe. Don’t worry. You don’t need any special pans since this cooks up beautifully in a crockery cooker. Bring it on. The fragrance wafted through the house all day. By dinner time, we were ready to devour it. You’ll either be drawn in or scared away by the rich orange and fragrant broth. All but one of my crew was intrigued. (I have one picky eater.) The broth is made from chicken stock, tomato paste, lemon juice, flour, garlic salt, cumin, ground ginger, cinnamon and pepper. 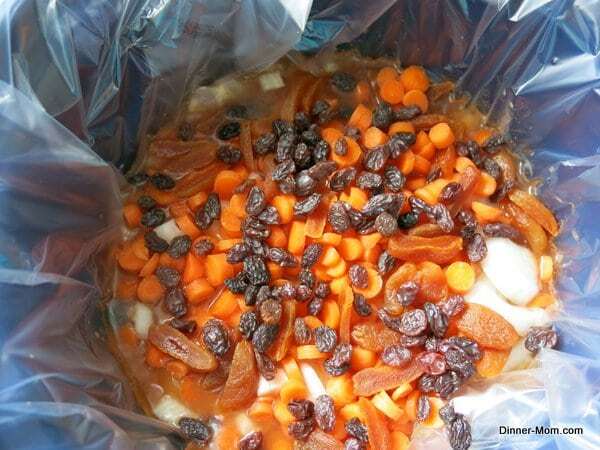 Chicken thighs are added to the broth and topped with carrots, onions, raisins and apricots. Cook on high for 4-6 hours or on low 8-10 hours. Sop up the rich broth with couscous or a little bread. 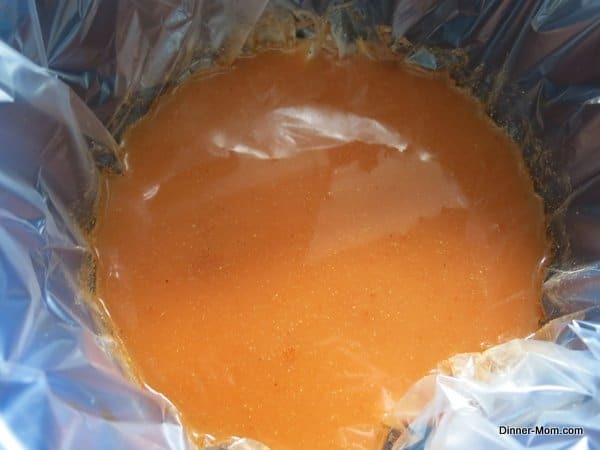 Make it ahead and freeze it: Add the ingredients to a ziplock bag, removing excess air, and store in the freezer for 2-4 months. Thaw completely in the refrigerator and then cook as directed. Boneless, skinless chicken thighs cook in a spicy, fragrant broth that is full of carrots, onions, raisins and apricots. 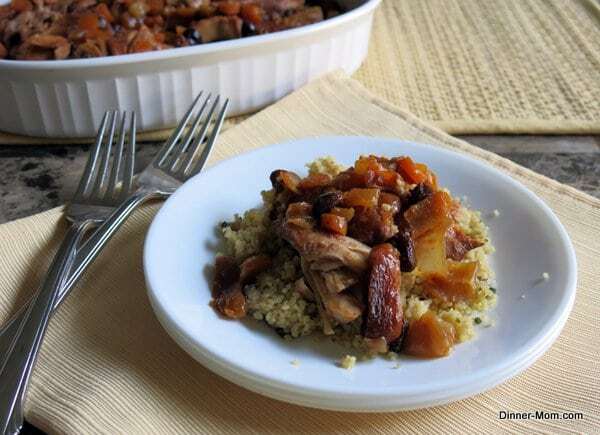 Serve over couscous and with some bread to sop up all the goodies. Combine the first nine ingredients in a crock-pot. 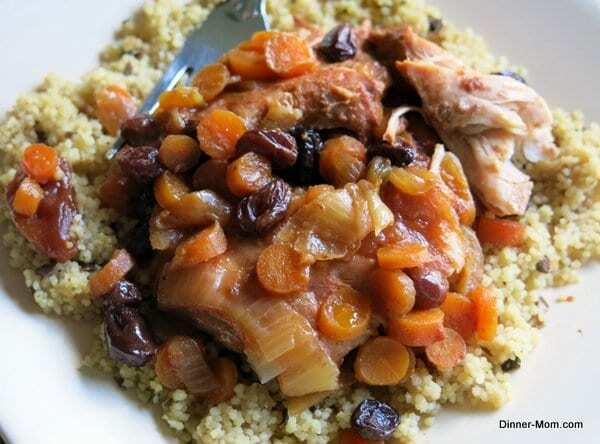 Top the chicken with onions, carrots, raisins and apricots. Cook on high or 4-6 hours or on low for 8-10 hours. This is a make ahead and freeze meal. Add all of the ingredients to a ziplock bag. Seal tightly, removing excess air and place in a second ziplock back for storage. Defrost completely and cook according to directions. Oh my! This sounds ( and smells ! ) like it will be delicious! I also like the tip about assembling and freezing for later use. Will crock pot this one soon..thanks!